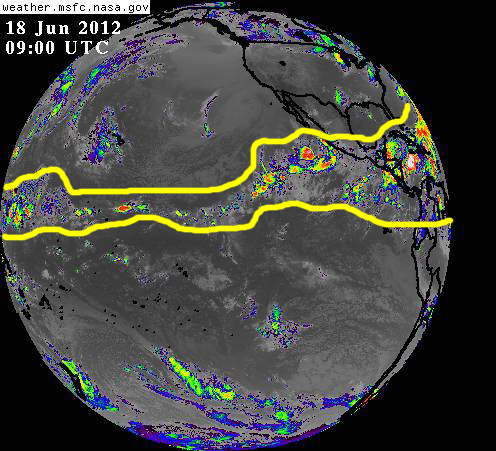 Today is Monday 18 June 2012 and there are plenty of boilers out there in the northern tropics and beyond! That area over Central America ranging from northern South America to Southern Mexico and waters of the eastern North Pacific, which we have reported about on this site, has now expanded to the entire Caribbean sub-basin and beyond into the Atlantic. 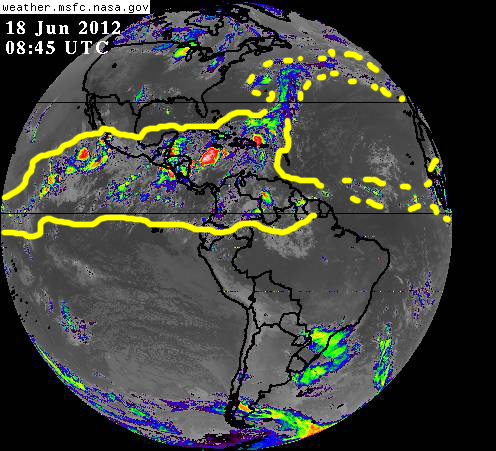 GOES satellite imagery on 18 June shows large cells of intensely stormy weather filling the entire Caribbean and surrounding islands and land masses. Just beyond this large region of disturbed weather, almost as if it were an offshoot of all this tropical activity, a cell of disturbed weather already exhibiting subtropical characteristics is active some 500 kilometers northeast of Bermuda, mowing east by northeast over the open waters of the Atlantic Ocean in the general direction of the Azores Islands. While this system is generating intense rain and gale force winds it poses no threat to the USA or, at least for now, to island communities further beyond in the North Atlantic. 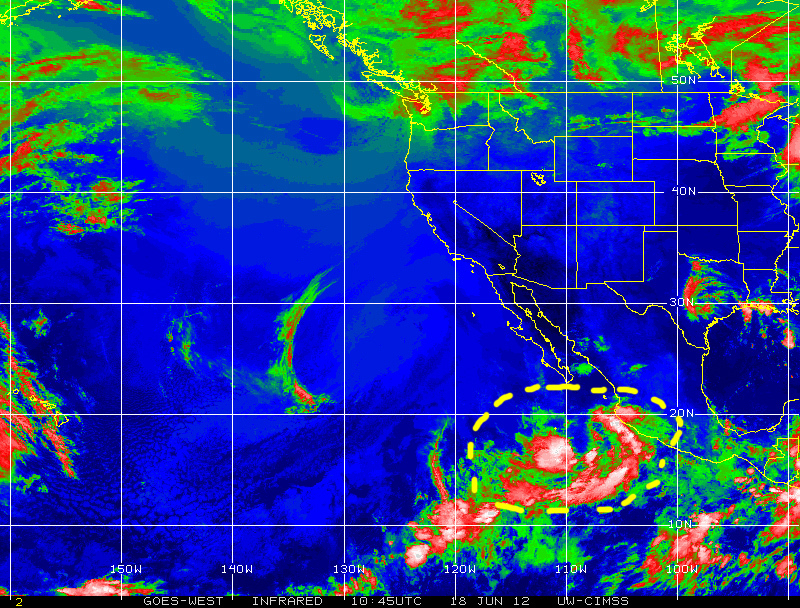 At the extreme northwestern range of this Caribbean-Central American-Eastern Pacific region of disturbed weather, it would appear the remnants of hurricane Carlotta have interacted with an area of low pressure to generate a sizable cell of disturbed weather some 450 kilometers southwest of Puerto Vallarta, Mexico, which is displaying some potential for cyclonic development as it moves away from the mainland. On a larger scale, the current tropical activity over the region described above extend westward, as part of the belt of tropical activity, far into the central Pacific Ocean and beyond into the southern fringe of the Northwestern Pacific, where there is plenty of tropical cyclone activity on this Monday 18 June, 2012, as reported further below in this post. However, the ‘belt of tropical activity’ along hurricane alley , the eastern Atlantic and Equatorial Africa, appears rather feeble and disjointed today exhibiting only modest activity and rather small and weak tropical waves further to the east. 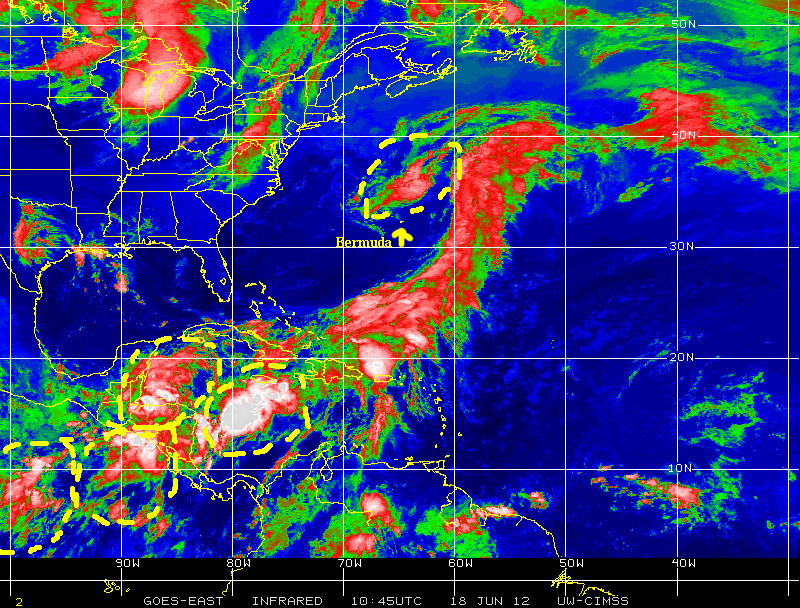 Except for the Caribbean, it appears as if the larger Atlantic basin is somewhat quiet for now, with most tropical activity taking place over the Pacific Ocean and the eastern regions of the northern Indian Ocean. Far, far away from Florida, some 18,000 to 20,000 kilometers to the west typhoon GUCHOL, now “weakened” to a category 3 tropical cyclone still rages in the Northwestern Pacific over the Philippines Sea sub-basin where it will brush by the Ryukyu islands as it continues to move toward Japan. 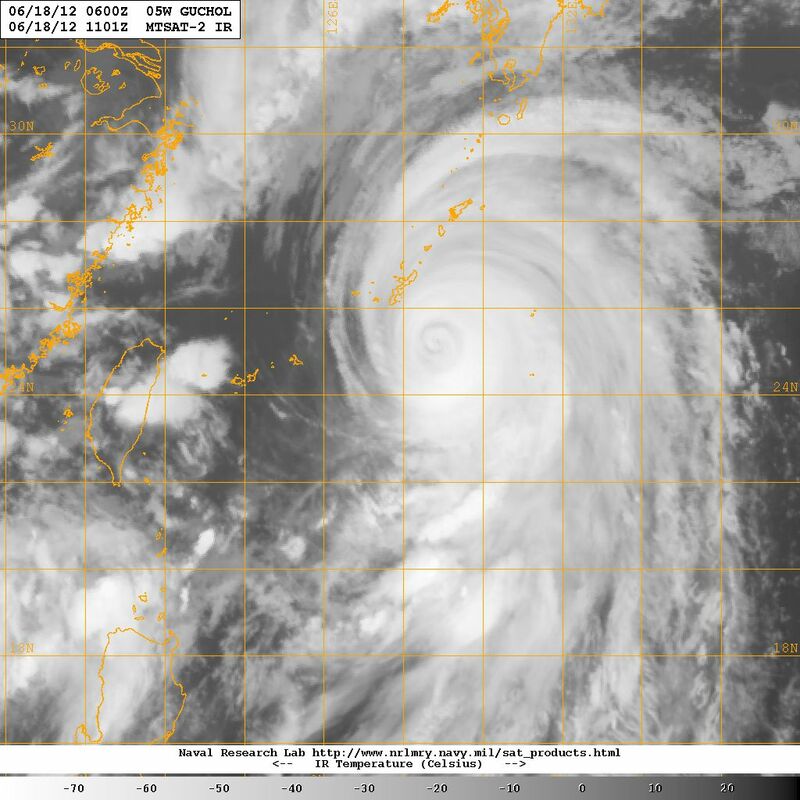 Based on its current track and prevailing atmospheric features it would appear the region of Osaka, Kobe, Kyoto, the Wakayama peninsula, and the island of Shikoku are the most at risk for a direct impact as the cyclone is forecast to traverse the country and emerge over the Sea of Japan over the next 2 – 3 days. 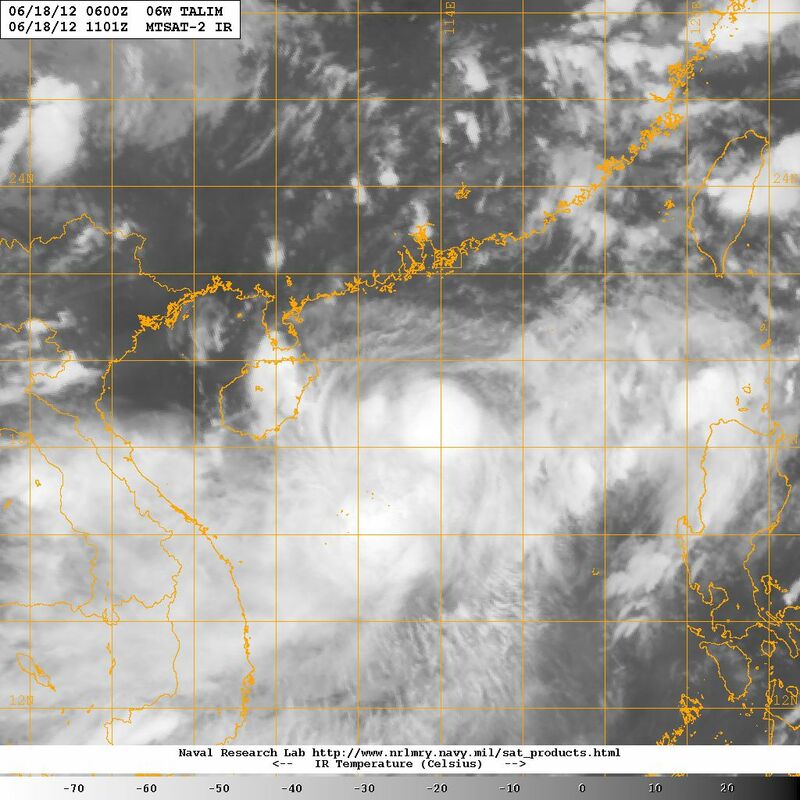 Nearby and to the southwest of Typhoon GUCHOL current location, over the South China Sea between the Philippines and China, tropical storm TALIM is moving to the northeast in the general direction of Taiwan and Japan further beyond. Still farther to the west the region from Vietnam, Laos, Cambodia etc. to the Bay of Bengal and the eastern regions of India are under a monsoon regime. with very large ares of disturbed, rainy and stormy weather covering most of the region. Widespread flooding and additional tropical cyclone development are possible . From the above information it is clear there is plenty that is ‘cooking’ in the northern tropics across our planet on this Monday 18 June 2012. Near our shores in Florida and half a world away, the tropics are ‘a-boiling’ as summer approaches in the northern hemisphere. We must remain alert, keep monitoring these flashes of potential cyclonic activity, and above all be prepared! And MITIGATE! !